The Anime Archivist: Video Backlog: "Planzet"
For some reason I’ve always been interested in Japanese anime DVDs with mythical English subtitles on them. Admittedly they’re pretty scarce, and when you find them most of the time the show has already been released in the US or Australia. Occasionally you’ll get a real rarity that for some unknown reason includes English subtitles that has no chance of being released in the west. This is one such show. You may be familiar with “Negadon: The Monster from Mars”, a 30 minute short written and produced by Jun Awazu. The film was released by CPM a couple of years before their demise. In that film, Awazu showed his love for old monster movies from the 1950’s and 1960’s in a CG animated format that looked quite good. 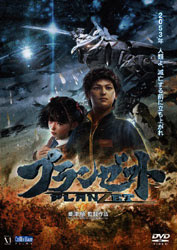 “Planzet” (though it should probably read as Plan Zet, i.e. a plan called Zet) is very similar to that first short. The giant monsters are replaced with an alien invasion, but the styling from 1950’s and 1960’s Japanese sci-fi films are very apparent. However parts of it are very modern. The robots for instance and the setting are more current in terms of design. The plot itself is pretty stock standard. Alien invasion plots have been done to death, and this one adds nothing to the genre. I understand that this maybe part homage to the genre, in particular old Toho sci-fi films, but it doesn’t make for interesting viewing. A lot of the lines are pretty corny as well, and it’s all a bit predictable in the end. The part where this film really, really shines is the CG. The background and sets as well as the mecha look incredibly realistic at times. The humans on the other hand… Let’s just say we’re getting to uncanny valley territory. The skin tones are incredibly real looking, and from behind sometimes I found it hard to distinguish between a human and CG. Their faces are wrong. Sure they aren’t the demented flesh puppets (as I call them) that appeared in “MS Igloo”, but they don’t look right either, particularly in the mouth region. Movements can be a bit awkward as well at times and for some reason the t-shirts characters wore just didn’t look right. Odd as all clothing looked good. It’s also odd that the entire cast is made up of six people. The army base depicted in the show seems to contain only four people. It may be easier to have a small cast for animation purposes, but it looks daft in a film like this which is told on such a grand scale. Summing up, it’s not a bad movie (well it did get a 15 screen release in Japan, so it’s a movie). The animation is pretty damn good but the characters look a bit wrong. One wonders why they didn’t just use real actors instead and matte them into the CG. The screenplay isn’t so great. I look forward to the next project Awazu does, but hope that someone else comes up with the story, not him. I’ll give it 6.5 out of 10, mostly for the fantastic animation and action sequences.